Success! Musa from Uganda raised $268 to fund gynecological surgery. Musa's treatment was fully funded on March 30, 2019. Musa’s total abdominal hysterectomy was done successfully. She is no longer at risk of pelvic pain and back pain. Musa is a farmer from Uganda. She is a mother of six children. For two years, Musa has been experiencing chronic pelvic pain. She has been diagnosed with chronic pelvic inflammatory disease. She needs to undergo a hysterectomy, a procedure in which surgeons will remove her uterus. Our medical partner, African Mission Healthcare Foundation, is requesting $268 to fund Musa’s surgery. On March 14, she will undergo gynecological surgery at our medical partner’s care center. Once recovered, Musa will be able to resume her daily activities free of pain. Musa's case was submitted by Joan Kadagaya at African Mission Healthcare Foundation in Uganda. Musa was submitted by Joan Kadagaya, Curative Medical Support Program-Partner Representative at African Mission Healthcare Foundation, our medical partner in Uganda. Musa's profile was published to start raising funds. Musa received treatment at Holy Family Virika Hospital. Medical partners often provide care to patients accepted by Watsi before those patients are fully funded, operating under the guarantee that the cost of care will be paid for by donors. Musa's treatment was successful. Read the update. Musa's treatment was fully funded. Symptoms vary depending on the condition that requires the total abdominal hysterectomy. If the cause is cervical, uterine, or ovarian cancer, there may not be symptoms, especially if the cancer is early-stage. In more advanced cases of cervical and uterine cancers, abnormal bleeding, unusual discharge, and pelvic or abdominal pain can occur. Symptoms of ovarian cancer may include trouble eating, trouble feeling full, bloating, and urinary abnormality. If the cause is fibroids, symptoms may include heavy bleeding, pain in the pelvis or lower back, and swelling or enlargement of the abdomen. Fibroids can grow large, cause abdominal pain and swelling, and lead to recurring bleeding and anemia. Cancer can cause pain and lead to death. Most cervical cancer is caused by a sexually transmitted infection called human papillomavirus (HPV), which can often occur alongside a HIV infection. As a result, cervical cancer is the leading cause of cancer death among African women in areas of high HIV prevalence. Cervical cancer is also more prevalent in Africa than in the United States due to the lack of early-detection screening programs. The other conditions treated by a total abdominal hysterectomy are not necessarily more common in Africa. The patient first reports for laboratory testing. The following day, the patient undergoes surgery. After the operation, the patient stays in the hospital ward for three to four days, during which she is continually monitored. The surgery is considered successful if the wound heals without infection, bleeding, or fever, and if the patient no longer experiences urinary dysfunction. In the case of uterine fibroids or early-stage cancer, a total abdominal hysterectomy is curative. If performed early enough, this surgery is low-risk and curative, with few side effects. This surgery is available, but many patients cannot afford it. Many women are screened for cervical cancer with a low-cost alternative to a pap smear. This is common in HIV treatment programs. If necessary, the woman is referred for surgery, which she often cannot afford. If cervical cancer is caught early enough, some minor procedures can solve the problem. Women with fibroids who still wish to have children may opt to undergo a surgery only to remove the fibroids, which is called a myomectomy. Oun is a 60-year-old rice farmer from Cambodia. She has ten grandchildren and enjoys watching both Khmer and Thai TV shows in her free time. Two years ago, Oun developed a cataract in each eye, causing her blurry vision and vertigo. She has difficulty seeing things clearly, recognizing faces, and going anywhere outside. When Oun learned about our medical partner, Children's Surgical Centre, she traveled for eight and a half hours seeking treatment. On March 11, doctors will perform a small incision cataract surgery and an intraocular lens implant in each eye. After recovery, she will be able to see clearly. Now, she needs help to fund this $398 procedure. 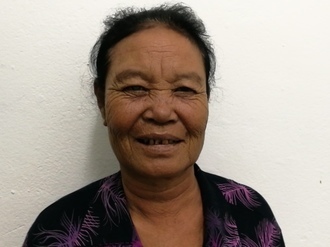 She says, "I hope that after my surgery, I will be able to go outside by myself and continue my work at the rice farm."